Poor poor logic. It's considered such a dreary and dull subject today, but I'm here to tell you: it's fun. Well, let's not kid ourselves: it may not be "fun" when compared with an evening of friends shooting each other in Halo 1 from our college days. But hey, it is at least enjoyable to the thinking among us, and has an ever-present impact on our thinking because no thought can happen apart from it. I have a tendency to write about what I've been reading, and I have a tendency to read about what I'm passionate about at the time. Recently, I finished a book recommended to me last year by my Professor, the one and only Gobbler: Mike Porter. I put it on my birthday wish list, and my parents bought it for me. It had been sitting on my shelf until not too long ago. 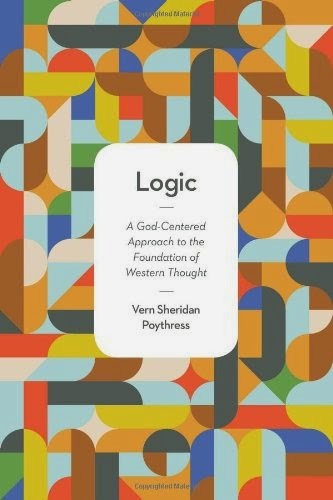 The book: Logic: A God-Centered Approach to the Foundation of Western Thought by Vern Sheridan Poythress. "Human thinking about logic needs redeeming" (pg. 25) ... "There are two radically different ways of understanding logic, not just one. There is the Christian way, and there is the usual modern way, which has also been the dominant way within the history of Western philosophy. The Christian way is to listen submissively to the instruction of Jesus Christ, who is the Lord of the universe. The modern way is the way of autonomy, where we treat our own human powers as ultimate when we engage in the process of evaluation" (pg. 35). Have you ever spoken with an unbeliever about your beliefs and the unchristian response goes something like this: "But I don't believe in the Bible, or in your God. Why should I believe what the Bible says? And why is the Bible more right than anyone else's opinion?" I've heard enough variations of this sentiment to now recognize that this is the basic non-Christian perspective. At the heart of non-Christian conviction is the desire to be autonomous; to be one's own god. This was Satan's great mistake, and the sinful error that led to Adam and Eve's fall that condemned the human race. Today we are now born corrupted by sin, and it is not something easily overcome. People don't want to be subject to an all-powerful Creator God, because that means they will have to answer for their behavior. Instead, they would be much happier being their own little god, who does what is right in his or her own eyes. This seems to me to be the root of all evil: loving the self more than the love of God. We become our own little idols that we worship. "The resistance to God's message is serious. It is not merely that people may defiantly stop their ears to argument (Acts 7:57). First Corinthians 1:18-31 indicates that the gospel seems "folly" to those who consider themselves wise. How can a criminal death on a cross, which looks like an ignominious defeat, really mean salvation? People also consider the Christian message foolish because it threatens their pride and position. They already have their own standards for evaluating claims; they have their own views of what is wrong with the world and what a reasonable remedy would be like. They have their autonomous standards for evaluating the Christian message" (pg. 43). The funny thing about logic, and the overarching point of this book, is that logic is not something that is "just there" as if appearing by accident. Logic is not something human beings invented to better explain the world, or assist with our rationality. No, logic would exist if human beings never existed because it exists in the mind of God first. In fact, if one were to deny the existence of logic, one would have to use logic to try to refute its existence, which is self-defeating (a point Poythress makes in the book). "We can transcend our immediate situation by reflecting on it. And we can transcend our reflections by reflecting on them. We can take a kind of God's-eye view, viewing ourselves from above, as another human being might see us or as God might see us. This transcendence is then one way in which we think God's thoughts after him. God is transcendent in an absolute sense. He is infinite. We are creatures. But we do have a kind of imitative, creaturely ability to transcend our immediate environment or our immediate thoughts or our immediate speeches. And we use this transcendence when we investigate logic. Every time we think, we imitate God's thinking. Every time we think about logic, we also imitate God's transcendence over the immediate" (pg. 78). "Thinking God's thoughts after him" is a point that is made again and again and again in this book. I'll be completely honest that I never even thought about how our thinking is imitating God and his thoughts. He spends a good deal of time explaining that aspects of our humanity are analogies to God. For example: our thoughts are an analogy to God's thoughts. It would be unjust to say that God thinks like us completely because He is infinite, and His thoughts are not limited by our finite-ness. But in some way (or ways), our thoughts resemble God's thoughts. In another example, many human relationships are imitative of God's triune Being. The 3 divine Persons: Father, Son, and Holy Spirit, have eternally been in communion with one another. They have also had eternal relationships with one another, for example: the Father and the Son. In an analogous way, human beings have fathers and sons. All human beings are also very relational and we desire fellowship and companionship. Genesis tells us that we are made in the image of God, in His likeness. I've previously believed that this primarily was limited to our ability to communicate, to be self-aware, and to think rational thoughts. The marvelous contribution that Poythress makes in this book is that being made in God's image also includes how we imitate God's attributes by our behavior and even our very thoughts. This includes our use of logic, whether it is recognized formally or not. "The things God has made testify to the logical ordering of the world. And logic itself, as an aspect of the mind of God, is reflected in human minds. Our own minds and their reasoning reflect the logic of God, which is eternal and all-powerful. We cannot escape this testimony because it is there indelibly whenever we think or reason. Whenever we use language we exhibit logic in our speech. Here, as well as elsewhere, God's attributes "have been clearly perceived." As a result, "They [ultimately all human beings everywhere] are without excuse" (Rom. 1:20). ... We are in rebellion against God, and we do not like to submit to him. We do not like the obligation of being thankful to him, because we have failed to be thankful. We are in flight from this God because it is too morally painful to contemplate our guilt and our failure. We make substituted gods in order to soothe our conscience. An impersonal something, or an impersonal logic, can safely be ignored, and lets us off the hook morally and religiously. We thereby fool ourselves" (pg. 81). We cannot escape logic because everything that exists is a testimony to the logical order of the universe. Logic also makes sense to us because it is an aspect of the mind of God. This is why we have defined laws of logic, and recognize that improper human reasoning can lead to improper conclusions, which we call logical fallacies. We know, at the core of our being, that there is a proper way to think and to reason, and to do otherwise is improper. How do we know this? The temptation is to claim that what logic really is, is our autonomous ability to create the most useful way of organizing and fine-tuning our thoughts. The problem is that logic transcends you, me, and all of humanity. The whole of Creation proclaims a logical order to it, and there is no denying this. If the source of logic is not the mind of human beings, then what is it? For the Christian, we know it comes from God, who is the source of all things. This is why when we speak with unbelievers about the truth, we aren't speaking to those who are ignorant of God's existence. The Scriptures tell us that all of us are made in God's image. This means we imitate Him in many ways - "We twist good purposes, and still reflect in our perversion the good purposes of God" (pg. 441). Therefore, it is helpful to remember that our friends, co-workers, or whoever else, are just like you and me. They were created in the image of God and reflect him in many ways. They have the Lord's moral requirements written on their hearts, and they know the truth you're telling them is true. They may deny it in many creative and fanciful ways. They may fall back on some religious system, or some formal scientific or philosophical system of thought (such as logic), in an attempt to continue in their rebellion against the Christian message. But one thing we know for certain: they know it be true. "Sin cannot easily be uprooted. It takes the redemption of Christ, not autonomously motivated critical thinking" (pg. 187). Just a few weeks ago I was speaking with a pair of very nice Jehovah's Witnesses who were making up contradictory answers as to why Hebrews 1:10-12 wasn't discussing Christ. They were literally coming up with any and every answer to avoid the clear teaching of Scripture. We have met for 3 weeks discussing this one passage, and though it is as clear as can be, Poythress is right: sin cannot easily be uprooted. Conversion to the truth requires more than the presentation of a logical argument. The Holy Spirit of God must regenerate the dead sinner, causing him to be born again. Only then can he repent and believe in the true and the living God. Oh, the depth of the riches both of the wisdom and knowledge of God! How unsearchable are His judgments and unfathomable His ways! For who has known the mind of the Lord, or who became His counselor? Or who has first given to Him that it might be paid back to him again? For from Him and through Him and to Him are all things. To Him be the glory forever. Amen. (Romans 11:33-36, NASB).